MPs face a "stark" choice between a short delay to Brexit - if they back Theresa May's deal - or a much longer one if they reject it, a minister said. David Lidington - Mrs May's second-in-command - was speaking ahead of a series of Commons votes on delaying the UK's departure from the EU on 29 March. The PM will make a third attempt to get MPs to back her deal in the next week. If it fails again, Mr Lidington said MPs would get two weeks to decide what they wanted to do instead. A series of votes began at 17.00 GMT, with the result of a vote on the main government motion to delay Brexit expected shortly. MPs have rejected Amendment H, which called for the UK to request an extension of Article 50 to allow another referendum on EU membership, by 334 votes to 85, with most Labour MPs abstaining. The cross-party amendment had been tabled by independent MP Sarah Wollaston, the SNP's Philippa Whitford and Joanna Cherry, Lib Dem Tom Brake and Labour's Neil Coyle. MPs narrowly rejected Labour MP Lucy Powell's amendment which asked for an extension to Article 50 to run until 30 June "to enable the House of Commons to find a way forward that can command majority support," by 314 votes to 311. Members also narrowly rejected Labour MP Hilary Benn's plan - to delay Brexit and for MPs to take control of the process on 20 March in order to try and find a way forward that is not the PM's deal - by just two votes: 314 votes to 312. Laura Keunssberg, the BBC's political editor, said the result was very significant and a huge relief for the government. A Jeremy Corbyn-backed amendment was defeated by 318 votes to 302. It sought to reject the prime minister's deal, reject a no deal Brexit, and called for an extension of the Article 50 process beyond 29 March to allow MPs time to "find a majority for a different approach" to the PM's deal. MPs are now voting on the main government motion on an extension to the Article 50 process for leaving the EU until 30 June if Parliament approves the government's Brexit deal by 20 March. Labour's Shadow Brexit Secretary Sir Keir Starmer said: "The idea of bringing back the deal for a third time, without even the pretence that anything has changed, other than, of course, using up more time, is an act of desperation." He said a government motion simply calling for a delay to Brexit would be easily passed, but by "wrapping it up" with a third vote on her deal, the PM risked further "splits and divisions" in her own party, something he said was "absurd and irresponsible". US President Donald Trump has also weighed into the debate, saying Brexit is "tearing countries apart". "I'm surprised at how badly it has all gone from a stand point of negotiations but I gave the prime minister my ideas of how to negotiate it, she didn't listen to that and that's fine but it could have been negotiated in a different manner," said Mr Trump. He was speaking in the Oval Office after greeting Irish premier Leo Varadkar. In July last year, Mrs May said Mr Trump had advised her to sue the EU rather than negotiate over Brexit. 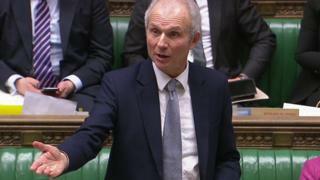 In the Commons, David Lidington indicated that the government would allow MPs to hold a series of votes on possible ways forward on Brexit if MPs again rejected the PM's deal. But he warned that a longer extension would mean "a sustained period of uncertainty... which I fear would do real damage to the public's faith in politics and faith in democracy". And it would also mean that the UK would have to contest the European Parliament elections in May, he added. MPs will vote later on a motion calling for a three month delay to Brexit if MPs back Mrs May's deal - or a longer one if MPs do not support it by 20 March, the day before the next EU summit. Any length of extension has to be agreed by the EU. European Council president Donald Tusk has indicated that the EU may be ready to offer a lengthy extension to negotiations if the UK wants to "rethink its Brexit strategy and build consensus around it". Northern Ireland's Democratic Unionist Party - which twice rejected Mrs May's deal in the Commons - earlier held talks with the government to see if a solution could be found allowing its MPs to support the PM in a future vote.